The latest release of the Plant Ontology, version #21, is available on our Plant Ontology Browser. This full release features the addition of 37 new PO terms, for both the Plant Anatomical Entity (PAE) (31) and Plant Structure Development Stage (PSDS) (6) branches of the ontology. Names have been revised for 23 PAE terms and 21 PSDS terms, and definitions of many more terms have also been revised and updated. Includes all revisions of the plant_ontology.obo file from Aug 2013 (#2228) to July 24th 2015 (#3502) on the PO SVN site. This Release also includes new and updated annotation data generated as part of the Plant Phenotype Pilot Project. Plant Ontology annotation files were compiled by the POC. New annotation data (#annotations) for five species from the PPPP : Maize (307), Arabidopsis (3339), soybean (34), Medicago (81), and tomato (147) (rice annotations (279) were added in Version #20). All these annotations are refer to genes associated with characterized mutant phenotypes. Additional annotation data was contributed by our collaborators for Soybean QTL (SoyBase;Glycine max) and and Arabidopsis thaliana (TAIR). You can find more information about the new annotations at: Main_Page#PO_Annotations_pages. After consultation with the GO Consortium, a new child term of plant cell was added. Native plant cell describes plant cells that are either part of a multicellular whole plant (PO:0000003) in vivo, or a unicellular organism in natura (i.e. part of a natural environment). This term is a sibling to cultured plant cell which covers all the cells grown in vitro. All the children of plant cell are now descendants of either native plant cell or cultured plant cell. New and Revised terms describing special roots (proteoid root) and shoot-borne (adventitious) roots and their parts (e.g. shoot-borne internode root, shoot-borne nodal root, shoot-borne root meristem, shoot-borne root apical meristem, shoot-borne root epidermis, etc). Added preceded_by relations to the vascular leaf expansion stages: vascular leaf senescence stage, mature vascular leaf stage, vascular leaf initiation stage. Moved plant embryo dormant stage (PO:0025377) to be is a mature plant embryo stage (PO:0001081) . Added new relation- 'precedes' to link the plant embryo coleoptilar stage (PO:0001094) plant embryo cotyledonary stage (PO:0001078) and the plant embryo true leaf formation stage (PO:0001095) to the mature plant embryo stage (PO:0001081). Added new term: multi-tissue plant structure development stage (PO:0025571). Moved seed development, fruit development, and plant organ development to be child terms and updated their definitions. Changed floral organ formation stage (PO:0025585) to be part_of flower development stage (PO:0007615), rather than is_a. 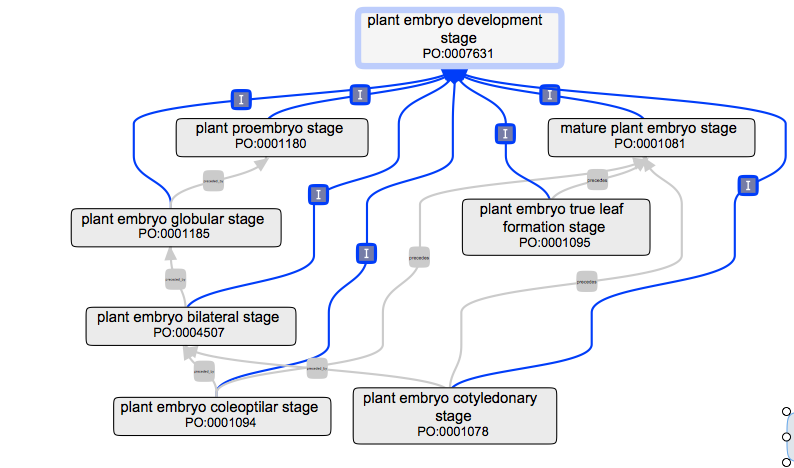 A new relation "precedes" was added to the Plant Ontology in order to order the plant structure development stages. Also used in seed development stages and on vascular leaf primordium polarity determination stage (PO:0025572). You can find more details about the new 'precedes' relation on the Relations_in_the_Plant_Ontology wiki page.